Here's another one on Wallis paper that I quickly finished - about four hours!! That's very exciting for me to finish anything in that short of time!! It's ATC sized, so not very big. Still experimenting on Wallis. I told my husband it's not good news. This is the second picture I've done on Wallis and both were done quickly and came out fairly good. I am very happy with my experience so far with this paper. That's not good! Wallis is not cheap. I can't afford to use it all the time!!! What's even more depressing is that I am working on two portraits as Christmas Commissions on Pastelbord and they are coming out horrible!! I have even been thinking about giving my client back her money. I've done these little pieces to help boost my confidence. I'm sure I'll get those portraits done in time, but it's rough going at the moment. Betcha all of you thought I had disappeared, huh? Well, now that I have a job that requires 33 hours per week, I don't have as much time for my art, unfortunately. 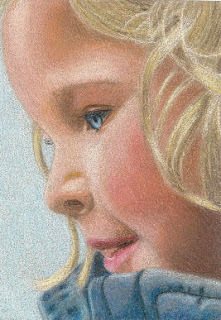 I also have two portrait commissions for Christmas that I'm working on and that is keeping me very busy as well. I finally finished a new piece. It's an ATC for an art trade on an art forum. I couldn't post it before now because they hadn't posted the results yet. So tell me you didn't see this one coming! Yet another macro of a cat. Granted it's a very big cat, but of the feline species nonetheless. :D I'm actually considering trying a landscape ATC for next month. Scary thought, huh? This was done with Prismacolors on Wallis sanded paper. The size is 2.5" x 3.5". I have been wanting to try out Wallis for some time now, but didn't have the money since Wallis is so expensive. I have no idea how artists can afford to buy Wallis! I only bought a pad with a few pieces of paper in it and it cost me as much as three full sheets of Colourfix paper. So I won't be using Wallis a lot, even though I did enjoy using it very much. The surface of Wallis is much rougher than the Colourfix, but it was, indeed, a pleasure to use. 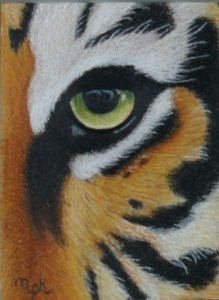 So, enjoy "The Eye of the Tiger"!